Grilled Veggie Salad Platter with Lime Sauce– The grill marks on these veggies let you know that there’s a lot of flavor to be had here. 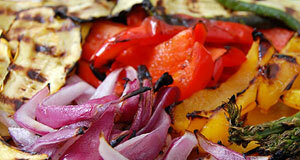 A nice assortment of vegetables that can be a light meal or a great side to any meat. The lime sauce accentuates the flavor of the vegetables. 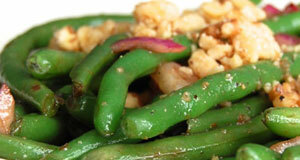 Balsamic Green Bean Salad– Green beans take center stage in this salad which is infused with the flavor of balsamic vinegar. It’s a quick and simple side salad to a meal and is best when green beans are in season and at their freshest. Grab some from your local farmer’s market and enjoy! Delicious & Healthy Cauliflower Tabbouleh– This cauliflower tabbouleh can work as a meal all by itself, or you can use it as a side option. Cauliflower replaces the bulgur that is usually found in tabbouleh, which removes the wheat from the recipe and makes it a Paleo friendly dish. 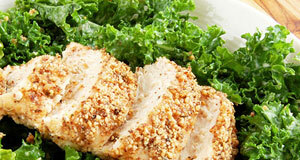 Kale Caesar Salad with Almond-Crusted Chicken– Here’s a wonderful Caesar salad made with kale instead of romaine and featuring a beautifully crusted chicken. Almonds give it a nice crunch and makes it much more satisfying while also adding in healthy fat, fiber, and extra protein. Paleo Taco Salad with Creamy Avocado Dressing– Taco salads don’t have to be giant fat and carb bombs when you make it a healthier way. Our taco salad features lots of fresh romaine lettuce, ground beef for protein, and a creamy avocado dressing that ties it all together. 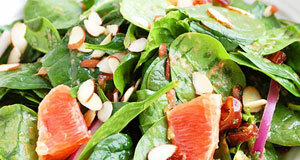 Blood Orange and Spinach Salad with Citrus Dressing– This tasty salad features a blood orange which gives it a nice citrus flavor and extra visual appeal. 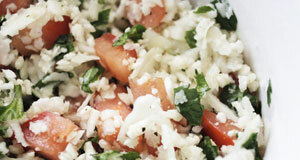 It’s served along with a citrus dressing that is tangy and refreshes the palate. There’s also sliced almonds and medjool dates for added flavor and nutrients. 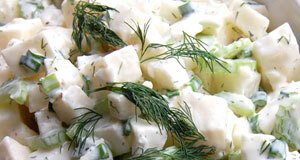 Paleo Jicama Dill “Potato” Salad– There aren’t any potatoes in this “potato” salad, with jicama being used instead. It still has the look and flavor of a potato salad, but uses Paleo approved ingredients that the body digests and processes in a better way. Bring this to your next picnic. 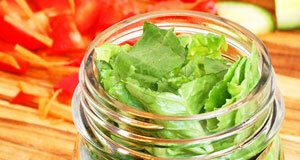 Simple Paleo Salad-in-a-Jar with Mustard Vinaigrette– When you want an ultra portable salad there’s no better option than this salad in a jar. It comes with its own mustard vinaigrette that drives home the flavor. Take it to work or anywhere else you need to go for a light and satisfying lunch. 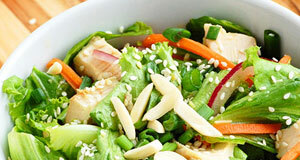 Classic Paleo Asian Chicken Salad– You’ll lose yourself in the classic flavor of our Paleo Asian chicken salad. 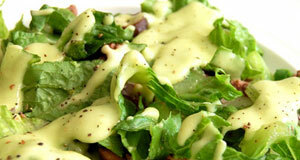 It has a special dressing that is inspired by Asian cuisine, with coconut aminos in use instead of soy sauce. Enjoy chunks of lean chicken along with an assortment of veggies. 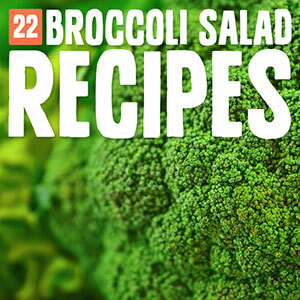 22 Superpowered Broccoli Salad Recipes– Put the broccoli you have on hand to use with one of these supercharged broccoli salad recipes. Each one shows you a new twist on an old favorite and uses broccoli as the main ingredient to make a healthy and delicious salad you’re sure to enjoy. 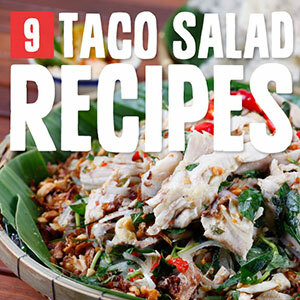 9 Paleo Taco Salads Without Deep-Fried Bowls– Ditch the deep-fried tortilla bowl and make a healthier taco salad the Paleo way. These recipes are proof that you can get real taco salad flavor without sacrificing your progress. Have them for lunch or dinner and they’ll definitely satisfy. 17 Paleo Chicken Salad Recipes– A delicious chicken salad recipe is just minutes away when you choose one from our collection. There are sweet salads and spicy salads and everything in between. 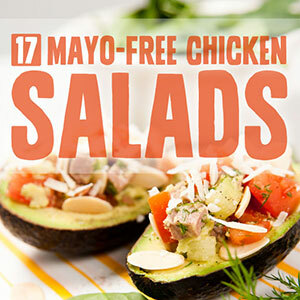 Take your chicken salad to the next level by selecting a great recipe today!